You've never seen anything like our amazing jukebox time machine! Just insert a quarter to travel to a past decade where Roxie, the time machine tour guide, will share a few nostalgic fun facts before dropping the needle on some of the greatest pop hits of all time. Feature up to 32 speakers on the minimal-rehearsal required script, while all the kids sing and dance along to iconic songs from the 1930s to the 2000s! Complete choreography included. Approximately 40 minutes. Recommended for grades four and up. 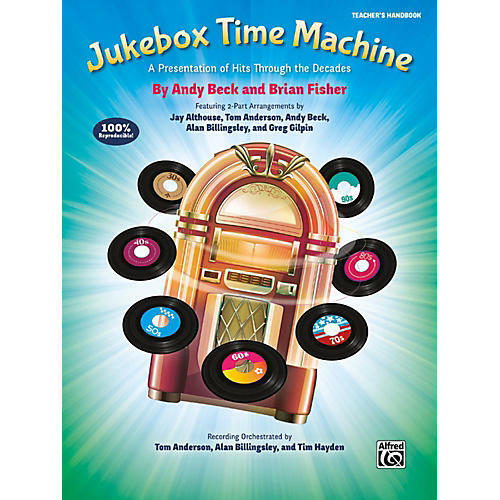 Titles: Jukebox Time Machine * Music! Music! Music! * She Loves You * Dancing Queen * Splish, Splash * Vogue * Don't Stop Believin' * Breakaway * It Don't Mean a Thing If It Ain't Got That Sing, Sing, Sing.